Three of us from the CyArk team just returned from spending a week in the Arizona desert digitally documenting two Hopi petroglyph sites, Tutuveni and Dawa Park. Tutuveni is the primary site of the project and is a great example of the power of the World Monuments Fund Watch List. 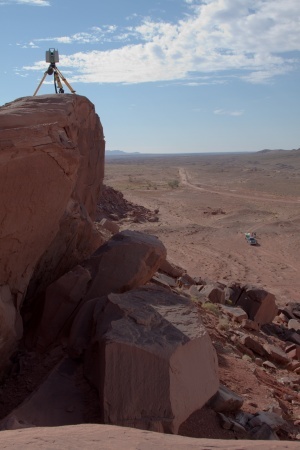 Through the 2008 WMF Watch List, Associate Professor Wes Bernadini, from Redlands University, was able to bring attention to the preservation needs at one of the most significant Hopi rock art sites. Wes Bernadini explains the significance of Tutuveni and the threats to the site from graffiti and defacing in his publication, Hopi History in Stone. Wes' efforts helped to place Tutuveni on the WMF Watch List which led to WMF contacting CyArk to Digitally Preserve Tutuveni. As mentioned above, along with Tutuveni, which is an important Hopi site located on Navajo Nation land, we documented another nearby petroglyph site, within the Hopi Reservation, called Dawa Park. CyArk was granted special access to Tutuveni through a permit issued by the Navajo Nation Historic Preservation Department and special permission from the Hopi Cultural Preservation Office to visit both Tutuveni and Dawa Park. Both sites are very important cultural resources for the Hopi and CyArk is grateful for the opportunity to digitally preserve these wonderful places and document the important history that is illustrated there. We were lucky enough to have Leica Geosystems generously loan us a C10 scanner and some other equipment for the field documentation. Our team chose to conduct the field documentation on this project in order to implement a new method for collecting high quality photography in the field. We approached the photography with a number of strategies to deal with differing light levels and shadows throughout the day. Among other techniques, we split up the scanning and panoramic photography for certain locations, by marking the location and coming back to take the panoramic photograph when lighting conditions were optimal. We also utilized reflectors, often used by professional photographers, to remedy problematic areas of low light. CyArk can now claim to have done the first glamour shots of Tutuveni. The week was a memorable one for our CyArk team of three. Justin Barton, Scott Lee, and I flew out of Oakland midday on Monday, September 27th to Phoenix. Due to Leica’s generous equipment loan, we set out on our journey with enough luggage and equipment to make us look fairly suspicious! Once we arrived in Phoenix we headed up to Tuba City in our trusty rental car, which would be our work horse for the week as we traveled on dirt roads through the Arizona desert landscape. Our team instantly fell in love with the two sites we were documenting due to their natural beauty and the amazing history we saw there. Lee Wayne Lomayestewa, from the Hopi Cultural Preservation Office, was wonderful in giving us the history of the site, explaining the meaning behind the petroglyphs, and giving us tours of some of the hidden passageways. Here is a short diary documenting the events of each day. The CyArk team walked the site with Lee Wayne Lomayestewa from the Hopi Cultural Preservation Office and Wes Bernadini, an Archeologist and Professor at the University of Redlands. CyArk also provided introductory training on field documentation to Lee Wayne and Wes, as well as two representatives from the Land Information Systems office within the HCPO, who visited the site in the afternoon. By the end of the first day, the team had completed the installation of all but a couple of points in the control network and many initial scans around a few of the primary boulders. The CyArk team had a productive day in the field, beginning work at sunrise and finishing with a last scan just after sunset. The team completed approximately 2/3 of the planned scans, along with some additional scans for context data. Detail scans of the boulders included a scan of the top face of boulder #48 from a truck bed provided by the crew that was on site installing the security fence around Tutuveni. Lee Wayne Lomayestewa was on site working the CyArk team for much of the day. The CyArk team began the day with a few scans from the top of the mesa at sunrise, in order to complete the control network and to collect more context data. The team also conducted some high resolution scans of the tops of a couple of the primary boulders from the top of the mesa before coming down to complete the remaining scans required on the ground. Lee Wayne Lomayestewa joined the CyArk team for several hours and had the opportunity for hands-on participation, setting up the equipment and conducting several scans himself. The team completed the field documentation at Tutuveni just before sunset. The CyArk team met Lee Wayne Lomayestewa at sunrise at Dawa Park, another Hopi rock art site, approximately 45 miles east of Tuba City. Dawa Park is a mesa that is the shape of a horse shoe in plan. 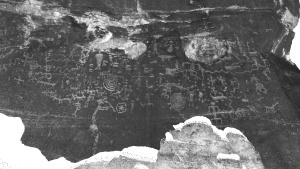 Panels of petroglyphs are found along the rock walls of the mesa throughout the site. The team conducted a few scans from the middle of the site for context data and then worked their way along the walls of the mesa doing lower resolution sweeping scans and high resolution scans of the panels at each location. The CyArk team and Lee Wayne worked together to move quickly through the site and succeeded in documenting approximately 95% of the panels identified by Lee Wayne at the start of the day. We closed out the project with a delicious dinner at the Hopi Cultural Center, where our team all became big fans of the blue corn Hopi fry bread. We were joined by Lee Wayne and his colleague Donnie Mahkewa. Both Lee Wayne and Donnie offered that it would be wonderful if we could come back when the project is complete to make a presentation to the larger Hopi community. We look forward to sharing the completed Digital Preservation of Tutuveni and Dawa Park. The scanner set up for a context scan on the top of the mesa. 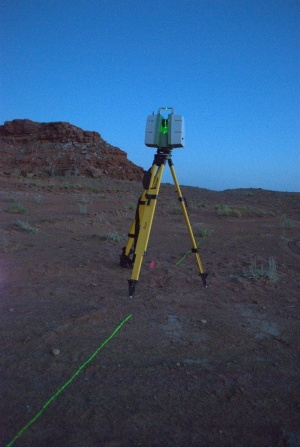 A scan across the desert landscape after sundown.